The Netherlocks Power Wrench is a portable valve actuator designed for quickly opening and closing manual valves. It is is fitted to the valve by a universal Drive Plate. This allows the use of one single Power Wrench for many different valves. The portable valve actuator can also be linked to a portable compressor and used in remote areas. Many companies in (petro)chemical, oil & gas, water and energy industries are already using the Power Wrench. The Power Wrench is a portable actuator that runs runs on air (4-7 bar). It is Ex (Atex) certified and can be used in any industrial area. The device saves valuable time and is easy to use. The Power Wrench is user friendly and helps avoiding user fatigue. 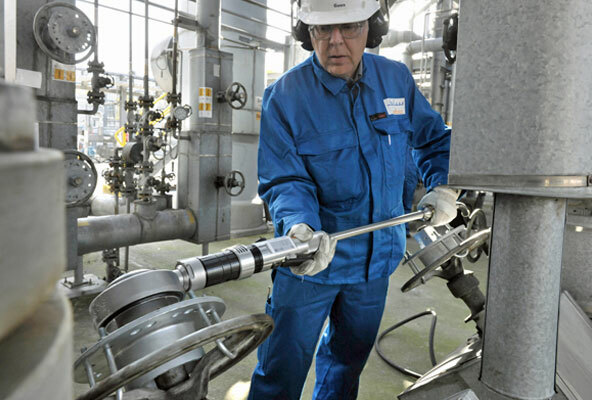 Valves can be operated faster, saving valuable time. Also the Power Wrench can be used as an alternative for using actuators. Only one single tool allows for opening many valves! The Power Wrench allows for faster valve operation in production processes. Use the Netherlocks Power Wrench contact form for more information or a free on-site demo.